About 1 in 5 people in the U.S. and England suffer from some kind of mental disorder. Other European countries have similar statistics from about 27 percent to 30 percent. Studies in South Africa say that over 30 percent of adults have suffered from some form of mental illness during their lifetime. The statistics that have been gathered are similar is most countries with mental illness affecting about 1 in 4 to 1 in 6 people. This is based on information that has been able to be gathered but keep in mind that many people never seek treatment. People have reasons for not seeking mental health diagnosis due to fear of stigma, lack of enough mental health facilities, lack of health insurance and other personal reasons that deter them. A mental disorder does not mean you cannot function, keep a job, be a good parent, or that you are not as good as other people. Something is defined as a “disorder” when it interferes in your life in some way. This varies from person to person as to how your life may be affected. Many people with a mental illness need medication in order to attain their best functionality and their best quality of life. Others are able to manage their mental illness with therapy or other intervention type treatments. Some people choose to use holistic or spiritual methods to deal with their mental illness. There are many different mental disorders including depression, bipolar disorder, borderline personality disorder and anxiety disorders such as PTSD and C-PTSD, Everyone is not born with mental illness and all mental illness does not have a genetic factor. The brain can be affected by trauma and by abuse. Disorders such as PTSD and C-PTSD are caused by abuse or trauma. Other disorders like depression and severe anxiety disorders can have roots in abuse including emotional and mental abuse. There is also a high number of people with other disorders that also either had abuse during their childhood or domestic violence as adults. Mental and emotional trauma can be caused by violence upon or around a person. It can be caused by being in a traumatic event or witnessing a traumatic event. Other things like living through a natural disaster, living in poverty, the loss of a child, wartime exposure, and many other things. The brain creates associations related to what it has experienced. Associations in the brain can cause emotional responses that arise from connections in the neural pathways. Different parts of the brain are affected by different mental illnesses. These can be seen in CT scans which were done to study the brains of people with bipolar. depression, OCD and other mental disorders. If you or a loved one suffers from mental illness you are not alone. With the percentage of mental disorders being around 30 percent most people have friends, family members or loved ones that have a mental disorder of some kind. You may not know about mental illness in all of your friends or family because some people keep it a secret from others. Mental illness is nothing to be ashamed of. The stigma about mental illness makes the problem worse by causing people to fear seeking help or to talk to anyone about it. 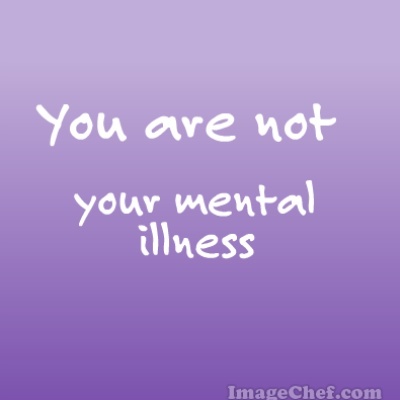 You are not your mental illness. Neither is your friend or family member. People with mental illness are not usually dangerous. There are only a few mental illnesses that predispose people to violence. Most people with mental illness are suffering within themselves and not causing harm to others at all. Suicide rates are high in every country. There many death related to suicide and the feelings of hopelessness, shame, guilt , fear and worthlessness that people live with. People who suffer from mental illness are not all the same. People are people and they are all individuals. Please do not see yourself as your diagnosis or as a label. You are unique and no one is just like you. Each person was born with value and worth that is innate. If you suffer from mental illness you should not have to feel shame about it. 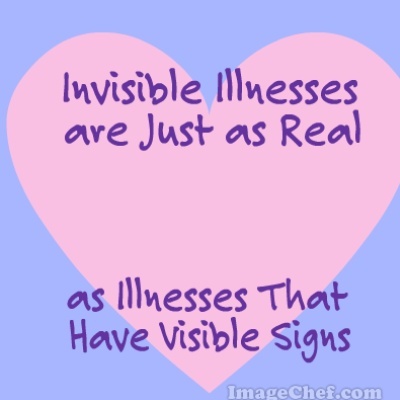 You just have an illness that is just as real as any physical illness. People with physical diseases and illnesses are more likely to be recognized and less likely to be judged as a person, in regards to their diagnosis. Just because mental illness is invisible does not make it any less real or the suffering any less.